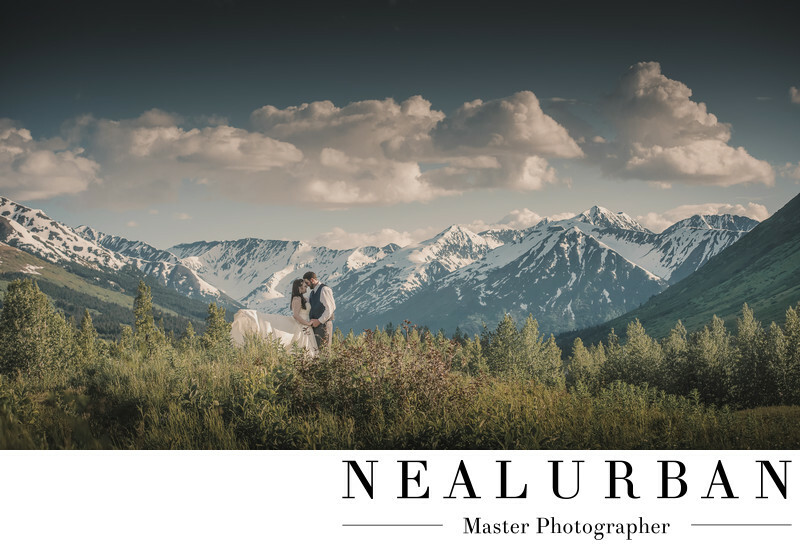 Sheryl and Rob flew us to Alaska for their destination wedding. Well, they lived there, but it was destination for us! They had their ceremony and reception at Settler's Bay Lodge in Wasilla, Alaska. We did not have much time for photos that day, so we planned another photo shoot the next day. The bride and groom wanted to take us and some of the bridesmaids to Seward to sight see for the day. The Seward Highway was amazing for photo opportunities. Neal and I mapped them out so on the way back we could stop with Sheryl and Rob for photos. There would be better lighting! This image showed one of our favorite spots on the drive. We could not believe this was going to be the back drop for one of the wedding images! It was breath taking. The bride and groom had changed into the wedding dress and suit and were ready for their close up. Then we went out onto this tall grass. We asked Sheryl and Rob to get really close. Everything looked amazing. The lighting was perfect, there were snow capped mountains in the back ground, and huge trees everywhere. Then we noticed the bride's dress was moving a little in the wind. We wanted to take this image up a notch. I went over to the bride and threw the train of her dress in the air. We did this a few times to get the perfect movement in her dress. We could not have dreamed for a better destination to photograph a wedding. This was a bucket list place for Neal. The bride and groom welcomed us into their family. We felt like we knew them forever. That made this experience even more memorable. We did more photos along Seward Highway. We stopped at Beluga Point along the water. We also found an abandoned train with snowy mountains behind it. We did photos another day at Matanuska Glacier park. Yes we took photos of the bride and groom on a glacier! Location: Seward Highway Alaska United States.